Sample and decant retailer Surrender to Chance has launched their debut fragrances, Coldwater Canyon and Surrender. The new scents were developed by perfumer AbdesSalaam Attar of La Via del Profumo. 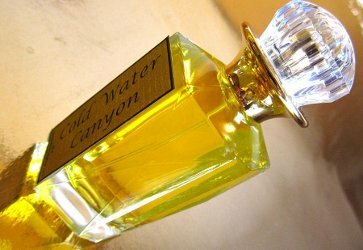 Coldwater Canyon ~ "Coldwater Canyon was suggested to us by a friend and long-time customer who asked for a fragrance inspired by the scent of a summer canyon full of sage, pine and mountain plants with sweetly scented night-blooming jasmine perfuming the night air. Coldwater Canyon is a perfect balance between a green perfume and a floral." Surrender ~ "Surrender is a rich jasmine floral that blends different jasmine absolutes with licorice, carrot, myrrh, gourmand notes and hyraceum. When we approached Dominique Dubrana we wanted to create a beautiful wedding scent and we were inspired by brides. Jasmine is used often as a wedding flower because of its narcotic and indolent qualities. After some testing of the fragrance, it was suggested that we add hyraceum to add a subliminal eroticism...It is also important to note that it is an ethical and sustainable source of animal pheromone which does not hurt the animal in any way as hyraceum is the crystallized and petrified form of Hyrax urine. Because of the nature of the ingredients in Surrender and for its function as a sensual aphrodisiac fragrance, animal pheromones have a sense and a place in it. While created as a wedding perfume, it is perfect for those who appreciate a glorious jasmine." Surrender to Chance Coldwater Canyon and Surrender are available now at the brand website, in sizes from 1 to 15 ml ($5.49-$65.88). Interesting, I am all for trying some jasmines. It is? Another must sniff. Will have to add these to a sample order at some point. Expended my post Thanksgiving shopping therapy chits at STC… Hopefully they’ll throw in samples of these. Both sound nice. Love that we can purchase by ml! Not sure they’re selling full bottles, actually…might be only by decant. He’s one of my favorite current perfumers. I’m really looking forward to trying these! I haven’t tried any from his line but have only heard good things. If you order samples, don’t miss his Mecca Balsam. Ever since I read glowing reviews of Tawaf, La Via del Profumo’s been on my must try list. When I heard about Surrender and Cold Water Canyon, particularly the former, I got really excited to try them. I’ll have to grab samples with my next STC order, and have to try Tawaf as well. Is it anything like A la Nuit? Nope. I’m one of those gluttons for jasmine who can easily take three sprays of A la Nuit, so obviously need to try Tawaf. If it’s stronger than the first blast of A la Nuit, the whole household might be trying it with me. Hyraxes. Hee hee It’s so funny that the petrified urine and feces of such a cute and goofy-looking creature is used to add sexiness to perfumes. Their incisors are kind of scary, though.